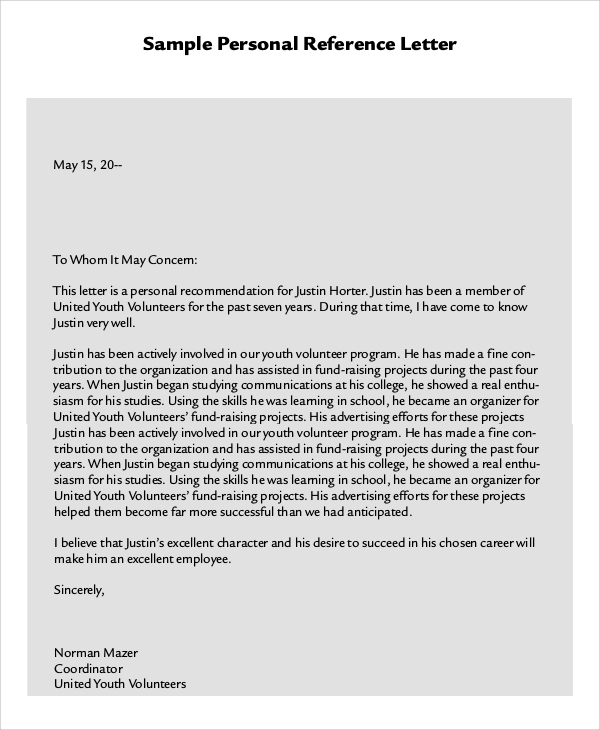 Sample Character Reference Letter is an endorsement of an individual’s conduct, stated either by another person of repute or an organization. Usually, it is a written statement, and five samples are listed here for different purposes.They can be used for the purpose indicated or customized for another. Sample Letters, as the name states is apparently used to electronically transmit the letters especially when the concerned authorities are located in distant places or countries. 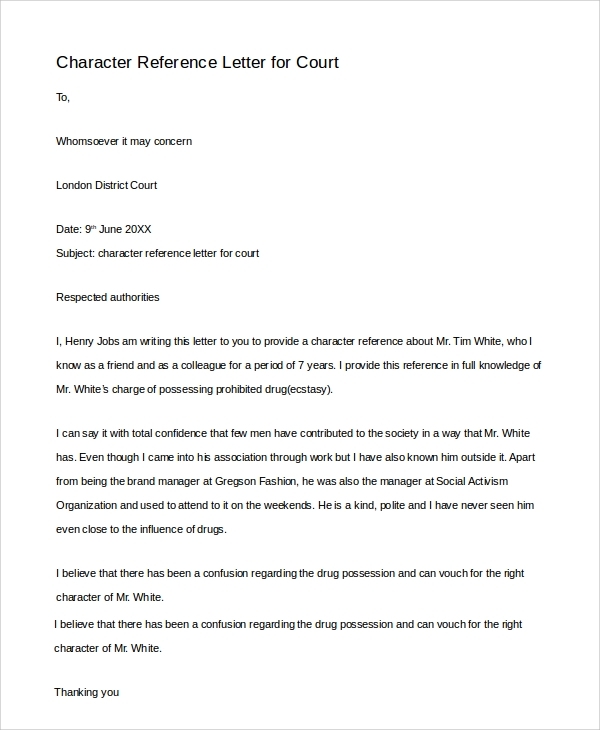 In the Character Reference Letter Examples presented here, a gentleman is courageous enough to vouch for a convicted friend in possession of a banned substance, indicating the possibility of a false implication. An individual residing in the same neighborhood of the applicant seeking permanent residency pays glowing tribute to his/her character and abilities to contribute as a model citizen if awarded status. 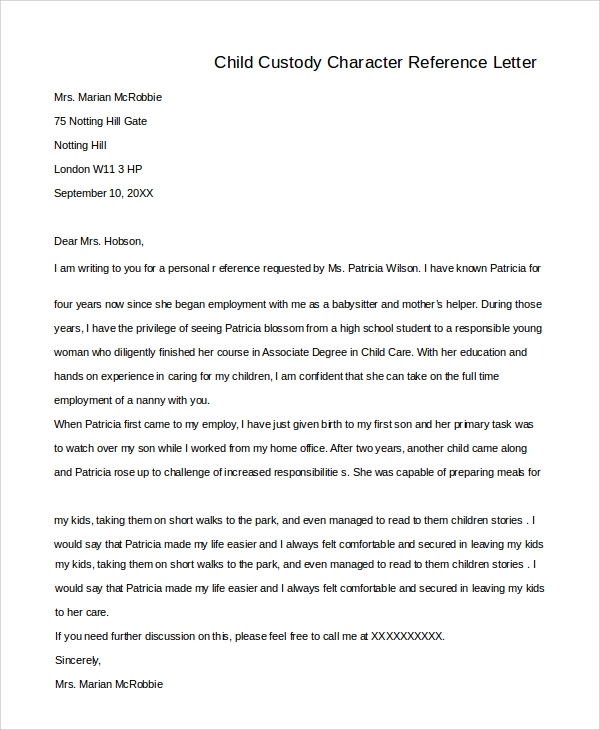 A character reference letter issued to a nanny by her previous employer, in which she explains in details about the capabilities and qualities of the individual in taking care of children. 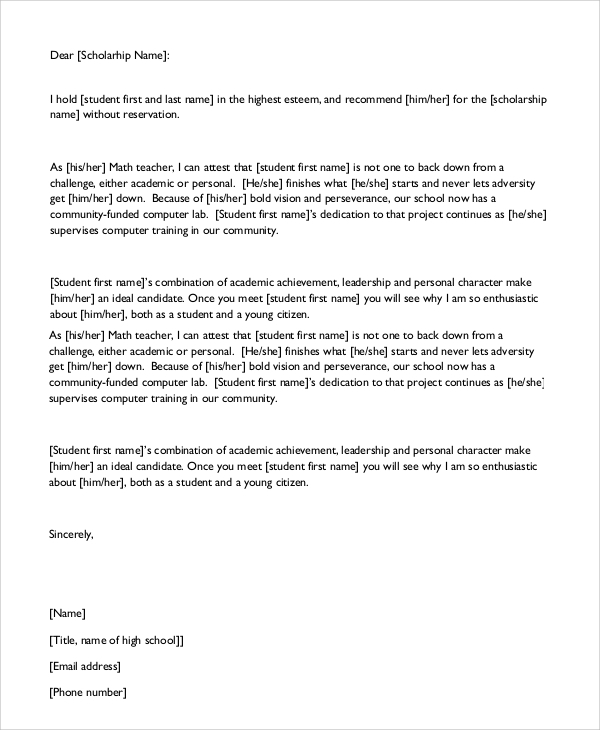 Character Reference Letter Samples is an important document for a private individual, a student and prospective employee as it adds value to their application, which could be either for a character endorsement, employment, scholarship or permanent residency. 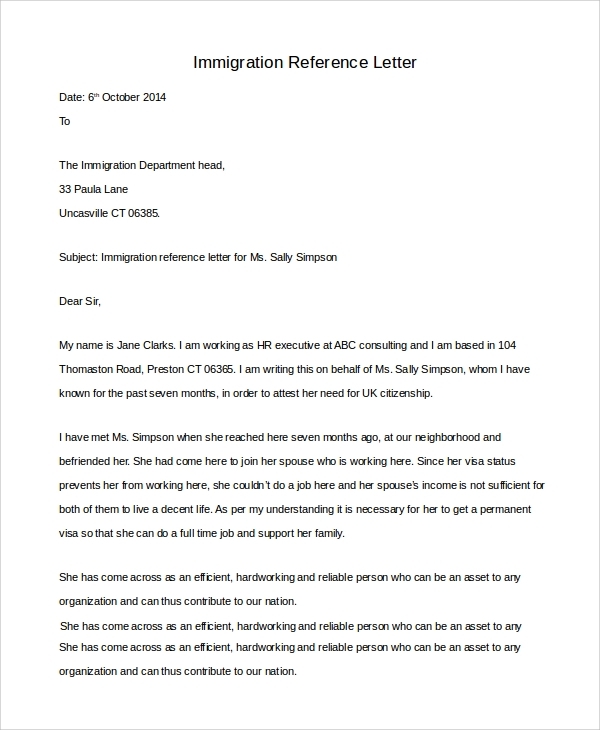 Many authorities pay a lot of attention to a reference letter, and the absence of one sometimes makes the difference between success and failure. The value of a letter is also determined by the status of the person or organization issuing it. 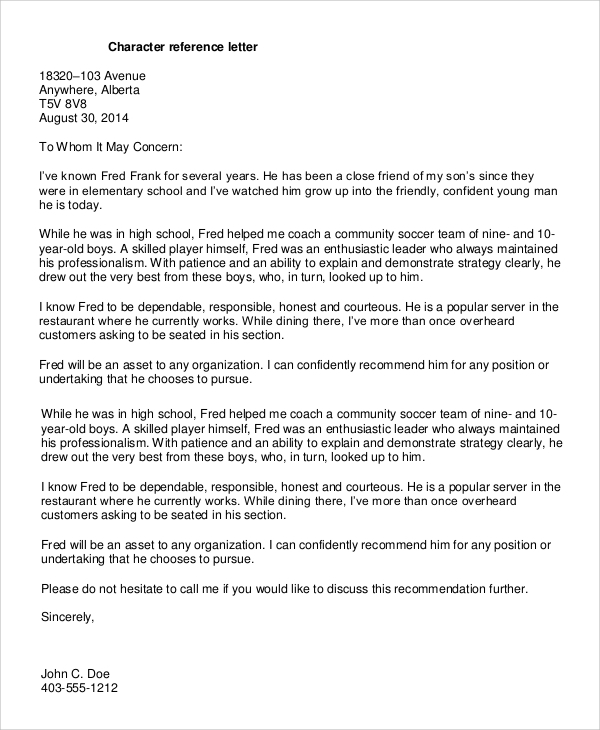 Personal character reference letter by an individual who enjoys a prominent status in society is invaluable. Likewise the same applies for a renowned organization. 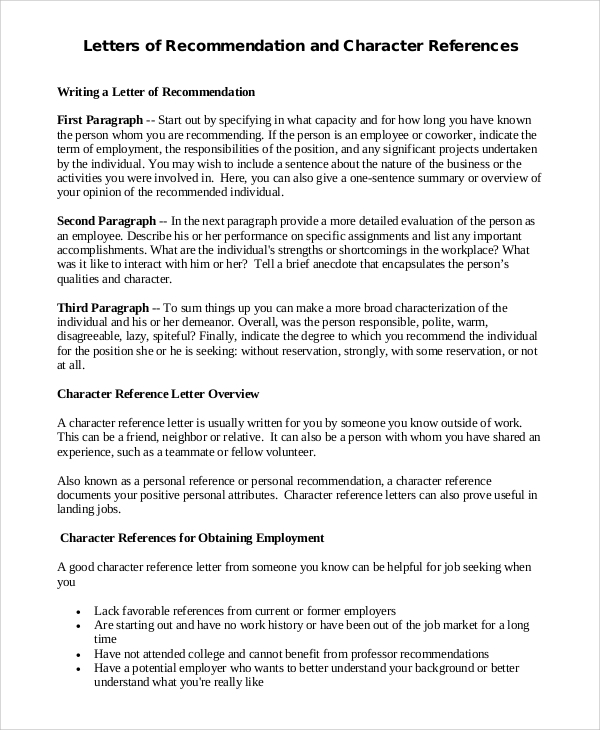 This sample lists out in detail the sequence of how to prepare a Sample Letter of Recommendation and character reference. It is broken it down into different sections, explaining about the contents of each. Before awarding a scholarship, the concerned authorities need to be convinced about the bonafide of the student, as well as his worthiness. The sample, in this case, is written with that purpose. Since a Character Reference Letters is looked upon favorably by authorities and on many instances could be the defining factor, it does, without a doubt, determine its undisputed use and value. Various options are there for the user to select and decide which is most appropriate for the occasion. Who can use these Reference Letters? Individuals seeking character endorsement, prospective employees applying for a job, students eagerly awaiting a scholarship and a hopeful immigrant, can all use these reference letters in their search for success and gratification. By now the value addition of Sample Character Reference Letter has been well documented to prove to the user its numerous advantages. Personal Reference Letter Samples too plays a crucial role in its purpose to certify and endorse the recipient about his/her integrity and loyalty.